Are you ready to feel the power and force of the Yin and Yang? Property Dragon is an amazing online slot game from Ainsworth Gaming developers. It is designed with 5 reels, 3 rows and 100 win lines. You will be welcomed by the vibe and good feeling of the Asian culture from the moment the game loads. Everything on the screen including the artifacts and symbols is made to reflect the rich Eastern style. Ainsworth has a long list of slots with high possible payouts, and Prosperity Dragon has been added. The betting range is from $0.02 up to a maximum of $10000 and a high theoretical return to player of 94.4%. Play Property Dragon slot from your smartphone or tablet anywhere in the world. It is built with the latest cutting edge technology which enables it to maintain stunning graphics and seamless gameplay. Continue reading our in-depth review to learn how this video slot works and where to play it online. The Asiana have very many beliefs, and they use different symbols while performing these rituals. The developer has used the red colour which is considered to bring luck. Yin and Yang is another common symbol that has been used in the game. This symbol plays a very crucial role in the Asian culture. The Yin and Yang are the two controlling forces of the universe, so they believe. The Yin represents the passive or negative force, while Yang is the active or positive force. You will find the graphics and symbols used in the game very detailed and blended with fine gold and red colours. The reels are set against a red velvet background and with a simple layout. Rest assured, you will find the game engaging and stunning both on small screen devices like mobiles and smartphones as well as on desktops. Property Dragon slot comes with 3 rows, 5 reels and 100 pay lines that can be adjusted. The minimum bet allowed on each win line is $1, but high roller gamblers can stake up to a maximum of $10000. 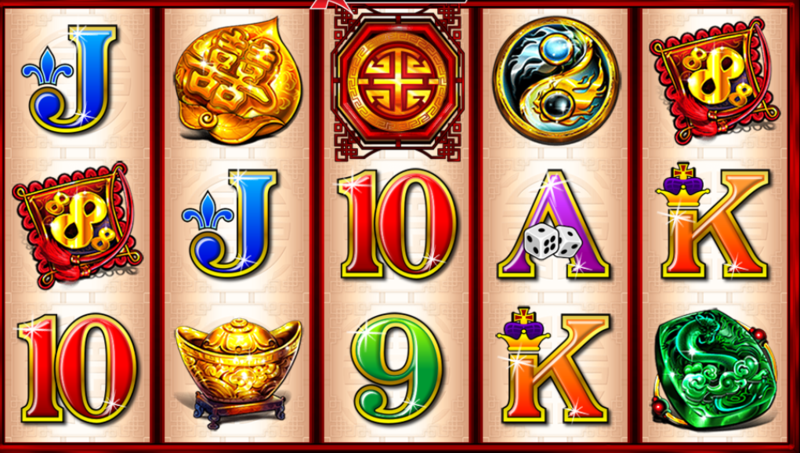 The maximum bet has a possible payout win of 500,000 for landing five of the Chinese pattern symbols. Click on the Cog icon to access the main menu with different settings to help you set the bet. To get more information about the paytable, click on the I icon. The Autoplay settings in Property Dragon slot works like any other slots from Ainsworth. It will enable you to play a set of spins without interruption. This slot game comes with HD images of artifacts from the Chinese culture to represent different symbols. The symbols are categorized as high paying and low paying according to the pay table. The lower paying symbols are represented by the standard deck card letters J, A, K, Q, 10 and 9. There are the high-value symbols which are represented by the pillow in gold and red, green ornament, red ornament, the Yin and Yang and the golden bowl. Prosperity Dragon comes with additional special features to boost your chances of landing the highest prize. The Dragon is the wild, and it replaces for all other symbols except the scatter symbol. This symbols will only appear on reels 3, 4 and 5 during the paid games. The Chinese Pattern is the Scatter symbol, and it will appear during the paid games only. The scatter symbol is responsible for triggering the free games feature. Other symbols you will come across include the 'Coins' which appear during the Super Choice Feature and the Ultimate Choice Feature only. The 'Gold Star' will also appear during the Free Games Feature, the Super Choice Feature and the Ultimate Choice Feature only and the 'Silver Star' will showcase during the Free Games Feature. Landing any three or more scatter pattern symbols will activate 10 free games. The Dragon will appear on reels 2, 3 and four only to substitute for all other symbols except the Silver Star and the Gold Star during the free games. During the Super Choice Feature, Gold Star will appear on reels 2, 3 and four only and substitute for all other symbols except the Dragon. During the Ultimate Choice Feature, the Gold Star appears on reels 2, 3, and four only and substitute for any other symbols except the Dragon. 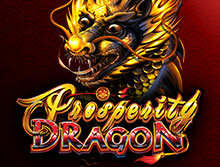 Play Prosperity Dragon Slot On the Go! If you are looking for a slot that is playable across all platforms, then Property Dragon is the best match for you. Ainsworth uses sophisticated technology such as HTML5 to create slots that are engaging and smooth on smartphones and tablets. As an instant play slot, you dont have to worry about downloading software or an app on your device. Log in from any mobile browser like Chrome, Firefox, Opera and Safari and play for fun or real money. Ainsworth Gaming has been in the casino gambling industry for more than two decades. The goal of the founder was to start a company that will provide high-end slot machine games, software and other related tools to operators. The Australian based company has grown widely, and you can now play their games online and in land-based casinos. They pride in being behind popular online slots such as Dragon Lines, Cash Cave, Roaming Reels and Mustang Money. There are dozens of online casinos offering this thrilling slot, but there is one thing that makes us unique. Our decent bonus offers! bCasino was launched in the Spring of 2018, but our popularity has spread far and wide. We are in partnership with some of the leading software providers in the iGaming industry including NetEnt, BetSoft, Playson, Play n Go and Evolution Gaming. With such providers, you expect to find a rich game portfolio comprising of blackjack, roulette, baccarat, poker and live dealer games. We hold a license from the UK Gambling Commission and use the latest 128-bit Secure Socket Layer (SSL) encryption software to secure all our customer personal information. All new players are entitled to a match bonus of up to $1200 plus 100 free spins. Our highly experienced customer support agents are available 24/7 via email and live chat to provide any help you may require.